Perfect location for air travelers - right next to the airport - you don’t even have to go outdoors. Lovely new facility - so well insulated one doesn’t even hear the planes. Was very happy with our stay. 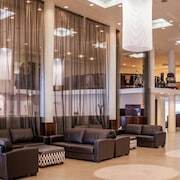 Where to find Wellington hotels near an airport? How can I find hotels in different Wellington neighborhoods? Where can I find hotels in Wellington that are near tourist attractions? From the affordable to the more upmarket, Wellington features a wide selection of first-rate short- and long-stay accommodation choices. Expedia's up-to-the-minute database has 76 hotel options that are within a 0.1-kilometre (0.1-mile) radius of central Wellington. 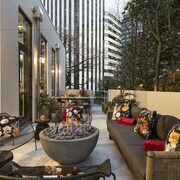 Location is everything when it comes to vacationing, so check out the latest offers at the Boulcott Suites and InterContinental Wellington, which you'll find within 1 kilometre (0.6 miles) of Wellington's center. With 2 Expedia-listed establishments, Newlands is the area with the biggest range of Wellington accommodation. Newlands is 8 kilometres (5 miles) from the center of town. Expedia-listed accommodations in Newlands include the Newlands Court Motel and Capital Gateway Motor Inn. 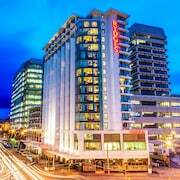 The Ohtel and the QT Museum Wellington Apartments are conveniently within strolling distance of the Botanic Gardens, while the Bolton Hotel and At Home Wellington City are positioned near St Paul's Cathedral.â€¨ the Wellington Zoo and Civic Square are other much-visited Wellington destinations. The City Cottages and the Courtenay Village are conveniently close to the Wellington Zoo, while the CityLife Wellington and the Aspect Apartments, are near Civic Square. The QT Museum Wellington and Amora Hotel Wellington are closest to the Central Library, while the Copthorne Hotel Wellington, Oriental Bay and Rydges Wellington are within a short stroll of the Cable Car Museum.â€¨ If you plan to book accommodation close the Massey University, choose from accommodation options which include The Wellesley Boutique Hotel - Heritage Collection and Distinction Wellington Century City Hotel. 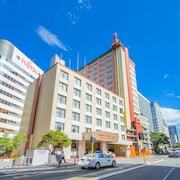 Finally, if your focus is on the Victoria University of Wellington, your nearby hotel options include the Quality Hotel Wellington and Quest Wellington. The Boulcott Lodge is 15 kilometres (9 miles) from the center of Wellington. Another accommodation option is the Bella Vista Motel Wellington, which can be found 3 kilometres (2 miles) away. 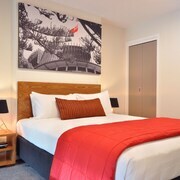 You could also choose to book the Acorns Wellington Bed and Breakfast or the Novotel Wellington. If time allows, you could travel to other places in the North Island region. Explore North Island's art museums and nature museums. You can also make the time to to admire the region's beaches, coastal plains, forests and rivers. Popular things to do in this part of New Zealand include snowboarding and skiing. Looking for more things to do? Why not spend the day discovering the Petone Foreshore and Bolton Street Cemetery in Petone, 11 kilometres (7 miles) to the northeast of Wellington. Some of our recommended Petone accommodation options include the ASURE 83 By the Sea Motor Lodge and B-K's Esplanade Motor Lodge. 45 kilometres (28 miles) to the northeast of Wellington you'll find Paraparaumu, which is home to the Elliotts Kapiti Coast Motor Lodge and Wrights By The Sea Motel. Lindale Park and the Southward Car Museum are a couple of the popular sites to see in Paraparaumu. Wellington International Airport is a convenient airport for arriving in Wellington. It is 6 kilometres (4 miles) away. If you choose to stay nearby, try the James Cook Hotel Grand Chancellor or Brentwood Hotel. What are the most popular Wellington hotels? Are there hotels in other cities near Wellington? What other types of accommodations are available in Wellington? Explore Wellington with Expedia.ca’s Travel Guides to find the best flights, cars, holiday packages and more!